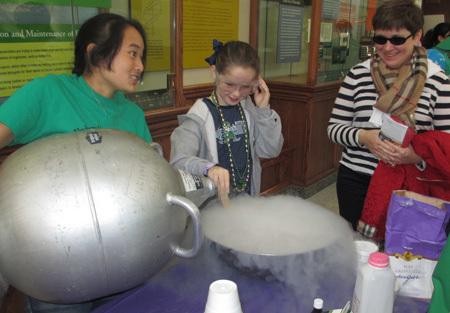 In celebration of this year’s National Chemistry Week, Jordan Hall of Science turned into a veritable sweet shop of marshmallows, ice cream, and M&Ms — all in the name of science. 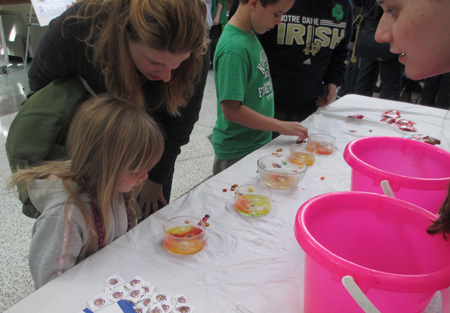 Saturday’s saccharine events were organized by members of Notre Dame’s Chem Demo team, a group of chemistry Ph.D. candidates who seek to make chemistry accessible to younger students. A number of the team members, including Kasey Clear, a fourth year graduate student, are considering careers in academia after graduate school. 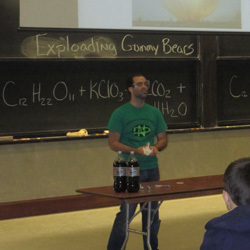 For Clear, the Chem Demo Team serves as preparation for a career focused on generating interest in chemistry. Originally published by Casey O’Donnell at science.nd.edu on October 20, 2014.